In honor of new Section 1557 revisions that place first preference on the person with a disability’s choice of accommodations with their health care providers, Sign Shares, Inc. will provide free wallet cards for individuals who are Deaf, Hard of Hearing, or Deaf-Blind. Sign Shares is an interpreting agency for all languages, and is Deaf and Hard of Hearing friendly, providing services 365 days a year, 24 hours a day. 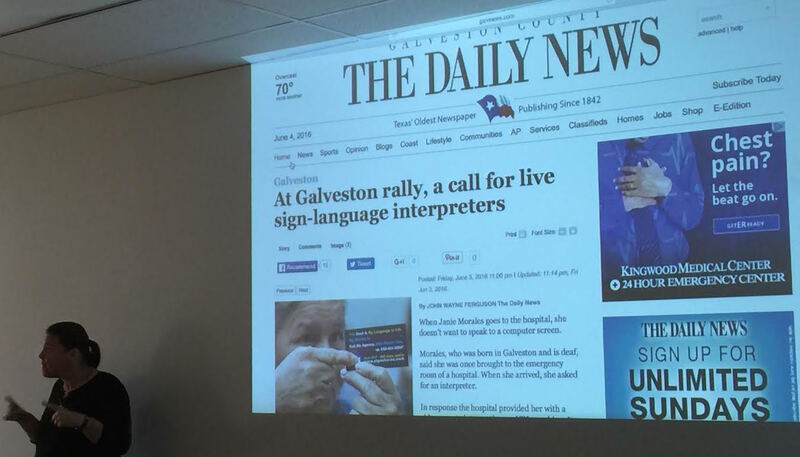 Through Galveston and Houston focus groups in partnership with The Capsule Group, or Capsule, as well as advocacy calls, the company has discovered that many health care providers don’t ask individuals which accommodation they need, causing problems for members of the Deaf Community. One recent example is when providers offer Video Remote Interpreting, or VRI, without consent of the individual needing services. Some individuals don’t know what it is, while others insist on face-to-face interaction for important events concerning their health. Other problems result from the denial of interpreters, or pressure for individuals to use unqualified friends or family members to interpret for them. Wallet cards will give those with hearing loss or deafness the ability to “Keep your rights, right by your side!” according to the website. Galveston resident Janie Morales demonstrates how she can use the cards to point out her rights. Orders your free cards here. Scroll down to enter your contact information. The Sign Shares’ website has also provided a countdown for when Section 1557 goes into effect, which you can see here by scrolling to the bottom of the screen. As of today’s writing, it’s 20 days away, but complaints may be filed now. Complaints may already be filed because the U.S. Department of Health & Human Services, who drafted the revisions, determined that existing laws that impact Section 1557 already required that health care providers attempt to use the patient’s choice of accommodation as a first choice. Want to keep up more with Deaf Community news? Like Sign Shares on Facebook.